Color will appear within 2 to 4 hours and lasts up to 7 days. Unfold towelette and in a circular motion, exfoliate with the coarse side and then turn towelette over to buff and smooth skin. For drier areas like elbows and heels, simply apply greater pressure. No need to rinse or wash after use. For best results, use before self-tanning. Apply evenly onto face and neck and allow to dry completely before dressing. Wash hands immediately after use. 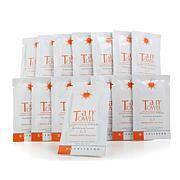 When used alone, On The Glow gradually develops a sun-kissed glow. 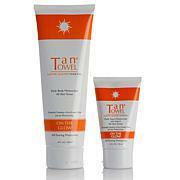 When used with TanTowel towelettes, On The Glow blends and maintains a sunless tan. Results may vary. For best results apply daily as needed. 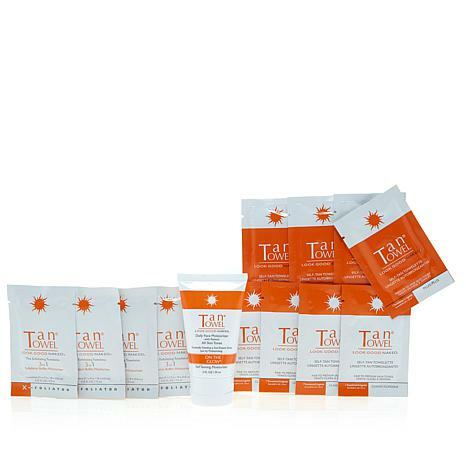 Ingredients: TanTowel On The Glow Self Tanning Moisturizer Ingredients: Water (Aqua), Glycerin, Prolatum Oil, Glyceryl Stearate, Dihydroxyacetone, Cetearyl Alcohol, Ceteareth-20, PEG-100 Stearate, Petrolatum, Dimethicone, Cyclopentasiloxane, Simmondsia Chinensis (Jojoba) Seed Oil, Retinol (Vitamin A), Persea Gratissima (Avocado) Oil, Olea Europaea (Olive) Fruit Oil, Erythrulose, Citric Acid, Cetyl Palmitate, Cetearyl Isononanoate, Ceteareth-12, Carbomer, Caramel, Calendula Officinalis (Marigold) Flower Extract, Avena Sativa (Oat) Kernel Extract, Polyquaternium-37, Propylene Glycol Dicaprylate/Dicaprate, PPG-1 Trideceth-6, Fragrance (Parfum), Sodium Hydroxide, Phenoxyethanol, Methylparaben, Ethylparaben. Ingredients: Water (Aqua), Cetearyl Isononanoate, Ceteareth-20, Cetearyl Alcohol, Glyceryl Stearate, Polysorbate 20, Glycerin, Ceteareth-12, Cetyl Palmitate, Fragrance (Parfum), Quaternium-15, Sodium Citrate, Propylparaben, Propylene Glycol, Methylparaben, Disodium EDTA. Ingredients: Water/Eau, Ethoxydiglycol, Dihydroxyacetone, Butylene Glycol, Polysorbate 20, Phenoxyethanol, Benzyl Alcohol, Sodium Metabisulfite, Potassium Sorbate, Tocopherol, Tetrasodium EDTA, Citric Acid, Fragrance (Parfum), Ethylhexylglycerin, Cucumis Sativus (Cucumber) Fruit Extract, Tocopheryl Acetate, Melaleuca Alternifolia (Tea Tree) Leaf Oil, Ascorbic Acid. Ingredients: Water/Eau, Ethoxydiglycol, Dihydroxyacetone, Butylene Glycol, Polysorbate 20, Phenoxyethanol, Erythrulose, Benzyl Alcohol, Sodium Metabisulfite, Potassium Sorbate, Tocopherol, Tetrasodium EDTA, Citric Acid, Fragrance (Parfum), Ethylhexylglycerin, Cucumis Sativus (Cucumber) Fruit Extract, Tocopheryl Acetate, Melaleuca Alternifolia (Tea Tree) Leaf Oil, Ascorbic Acid. I thought I would give these tan towels another try. The first time I tried these was two years ago, but had to discontinue use. Tried once again, and after the first three applications applied to only my legs, I broke out in red itchy dots as I did the first time. I did start to see a slight tan to appear so I can not say how much more I would have tanned if I had continued using these. Just not right for me. i don't know if i got a bad batch, or the chemical make up has changed. It barely shows and when i use on face, it's orange color....I used the exfoliator also, so i know that wasn't it..very disappointed..
Get the gorgeous, golden skin you’ve always wanted without the need to lie out in the scorching sun. 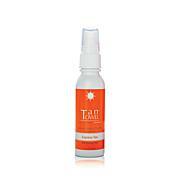 TanTowel is a quick and simple, no-mess application system that results in a streak-free and beautifully even tan—every time. 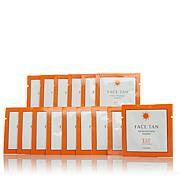 This ultimate self-tanner is the smart way to tan!